The paper originates from the casual observation that the application of the Devereux and Griffith methodology to calculate bilateral effective average tax rates (BEATRs) leads to results indicating that BEATRs for German outbound investment increased sharply from 1999 to 2001, despite a marked reduction of the statutory corporate tax rate in Germany and more or less unchanged tax systems in the other EU countries. 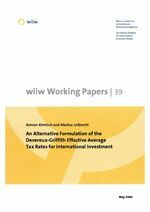 In reviewing the Devereux and Griffith methodology we find that this inconsistent result is due to the way split-rate corporate tax systems are accounted for. Thus, in the original Devereux-Griffith framework only FDI home-country tax provisions are considered, while a possible existence of a split-rate system in the FDI host country is completely neglected. Moreover we find that debt financing of an outbound investment is not correctly specified in the Devereux and Griffith methodology. In this paper we propose a revised methodology which takes into account home- and host-country split-rate systems as well as international aspects of debt financing more thoroughly. The application of the revised methodology to the original data yields more plausible results than does the original methodology. Most importantly, the observed increase in the German BEATRs due to abolition of the split-rate system is avoided under the revised methodology.